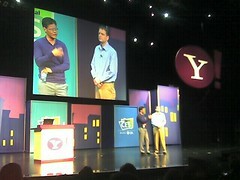 One of the things I left out of my earlier David Filo interview post were the details of Jerry Yang’s talk, which I’d have to say was lackluster given the amount of attention the markets are paying to Yahoo leadership right now, and given the slick pizzaz of yesterday’s Gates keynote. (C’mon Jerry – no Guitar Hero action?). Yahoo spent a lot of time talking about and “introducing” Yahoo Go” Version 3, a product I’m not familiar with but Yahoo treated as if it was a household word. It looked a lot like the MS mobile phone innovations and offered excellent info+browser+mapping+data integration for phones. Also announced was an expansion of mobile and widget platforms to make them more “open” and therefore more appealing to developers, though I’m not clear how significant this will be. Yahoo, like Microsoft yesterday, noted that they are looking at *billions* of mobile users and that although PCs are still important to them it’s clear that mobile is the bright and shining star where innovation will be happening. Disclaimer: I’ve got some Yahoo Stock, but none of it was helped by this post. This entry was posted in blogs, CES, CES 2008, companies, computers, conference, Youtube and tagged filo, mobile, yahoo, yahoo go, yang. Bookmark the permalink. Yahoo, like Microsoft yesterday, noted that they are looking at *billions* of mobile users and that although PCs are still important to them it’s clear that mobile is the bright and shining star where innovation will be happening. A cyber Anti-trust booth at CES might also be appropriate. Mobile? Maybe a Gates-or Yahoo-exec-mobile, though their Ferraris probably already have bullet-proof glass, along with the dash-mounted laptops, etc. (If there were some seminars like on “Cracking multinational corporations and/or Fed firewalls for phunn and profit” seminars, we’d be tempted to putt over there).